A video purportedly showing a man getting kicked off a Delta flight for speaking in Arabic went viral Wednesday morning, an assertion complicated by the fact that the man is a YouTube celebrity known for perpetuating viral hoaxes. 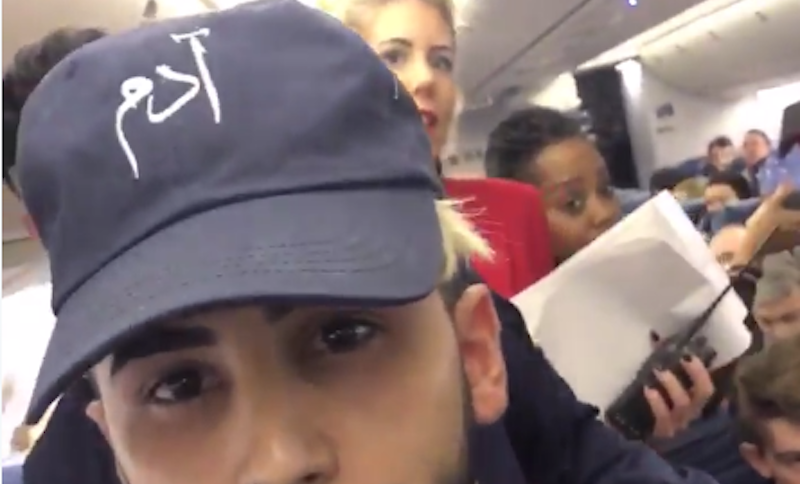 The video, shot and posted on Twitter by known prankster Adam Saleh, appears to show Delta Airlines representatives escorting Saleh off a plane. In the minute-and-a-half clip, Saleh says he was removed from the New York-bound flight because “We spoke a different language,” and tells a group of passengers yelling “bye” and waving at him that they’re “racist.” Only one man speaks up for Saleh and his friend; the other passengers look down or away from the camera. In a second video, filmed on Periscope and posted to Twitter, a tearful Saleh goes into more detail about “17 white people” who he says asked the flight attendants to remove him from the plane. On Twitter, Saleh says Delta brought police to interview him before ultimately rebooking him on a different flight operated by a different airline. According to his Twitter timeline, he is currently in the air on the way to New York. But Saleh, who is known for videos like “Killer Clown Prank Gone Wrong,” and a 2014 video he made about racial profiling that was later revealed to be a hoax, made headlines just last week for perpetuating a viral hoax against a different airline. In the video, posted to YouTube, Saleh pretends to stow away on a TigerAir flight by hiding himself in a checked suitcase.